Recently I wrote about Facebook friends and suggested that we each make some time to contact those people who are our real friends. This suggestion was based on data that shows that those with friends and support systems live longer and healthier lives. It turns out that there is even more interesting research that shows how important friendship can be to the success we experience during our lives as well. As Todd Kashdan, Professor of Psychology at George Mason University explains, some of the research is based on the feeding behavior of ostriches. If you’ve ever seen an ostrich, you know they have big round bodies, long skinny legs, and a tiny head on top of a long curved neck. And, as Dr. Kashdan remarks, if you’ve ever tasted ostrich meet, you know they are delicious. Their predators know that, too. That makes it necessary for ostriches to keep their heads up, always alert to the proximity of a hungry predator. Unfortunately, when an ostrich is foraging for food, he has to lower his head to the ground. Elevating and lowering his head over and over again takes a lot of energy. 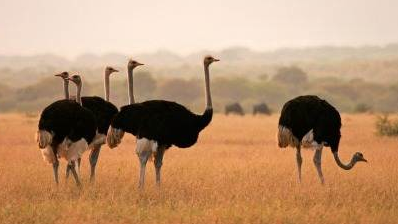 So ostriches have adopted the habit of foraging in herds, so they can take turns lowering their heads. This saves a lot of energy, and also saves a lot of ostriches. Similarly, we humans outsource many of our energy-requiring tasks. If we live alone, we know that we have to spend considerably more time and energy on our ADLs than if we live with others who will share some of these tasks. If we are in a dangerous environment, we stay awake unless we have someone to share the job of being a lookout. It turns out that we budget all of our energy-requiring tasks based on the proximity of trustworthy people in our life. This ability to share leaves us with more resources to direct to activities other than survival. Activities like professional achievement, enrichment, service and just plain fun. In another study, people were asked to estimate the slope of a hill they were about to climb. When they were climbing alone, they over-estimated the slope. When they were climbing with a friend, they estimated the slope accurately. Life feels easier and we feel more powerful when we have people we can trust by our side. What can you do TODAY to strengthen your own friendships? Your happiness, sense of self, potential and success may depend on this. With your actions, you will also build your friends’ sense of self, potential and success. What a powerful thing to do. This entry was posted in mindfulness, physician coach, physician coaching, physician communication, physician fulfillment, physician work life balance, work life balance and tagged leadership, medical career, physician coach, Physician coaching, Physician fulfillment, Physician work life balance, relationships, success, work life balance. Bookmark the permalink.